It's no secret for many GMs that combat encounter creation can be difficult to build and balance for your party. With D&D 5e, it becomes a bit of a chore with their adjusted experience calculations. I have recently started my first 5e campaign outside of the Starter Box, which was very good, and I wanted to compare and stress test the encounter building method laid out in the books. 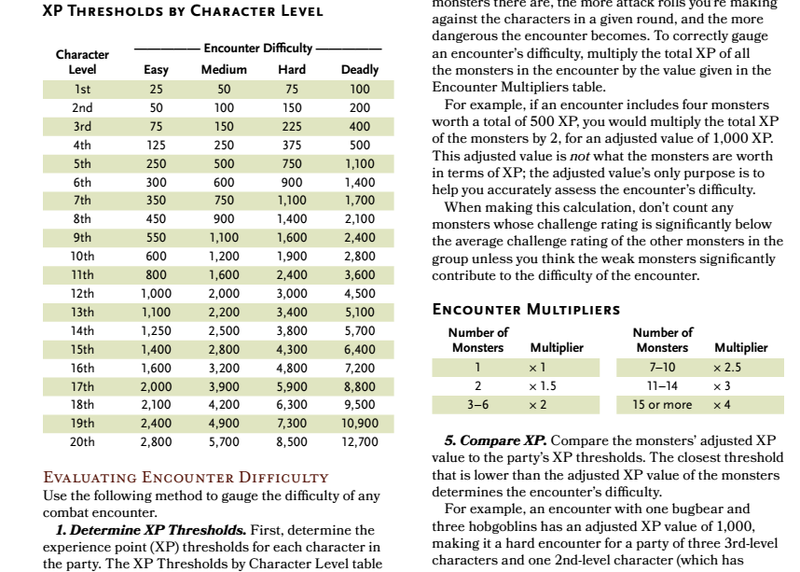 A snap shot of the encounter building rules from the Basic DMG. I first started off by comparing the encounter building rules with the encounters laid out in the Starter Box. I was not terribly surprised to find out that most of the fights in the published adventure were well above the deadly threshold for my three party group (A wizard, rogue, and bow fighter). To research the lethality of the system, I didn't adjust any of the combats, forcing the players to think creatively on how to approach each encounter. About a year after I ran the Starter Box, I have just started up a nonpublished campaign. To test the encounter building rules in the source material, I decided to run the players through a range of combats from a difficulty of medium to deadly. Below will be a list of the encounters I have run the party through. For most of the encounters, the party consisted of four players. A fey pact warlock, rogue thief, martial ranger, and a totem barbarian. For each encounter I will include the enemies, setup, xp, adjusted xp (axp), and my brief thoughts on how the fight went. So far, I have ran my players through six homebrewed encounters. Thoughts: Party was overwhelmed by damage resistance. Used clever distraction to escape birds. Only one swarm eliminated. * Party consisted of only rogue, ranger, and barbarian. Thoughts: Party was not challenged much. Used clever way to deal extra. * Party consisted of only rogue, ranger, and barbarian. Thoughts: Party had easy time. Could be down to poor dice rolling. Play tested this encounter using Starter Box wizard, cleric, sword fighter, and rogue; had difficult time. Thoughts: Party used other resources to distract and disorient before dealing with the ogre solo. Ogre (solo a medium fight) was easily dispatched. Warlock used illusions and sleep spells to take out the cultists. Thoughts: Was a good fight for the party. Not too hard or easy. While this is only six encounters, my observations on the encounters seems to lead me to a couple of conclusions. First off, the encounter building rules above call out to ignore monsters with CRs significantly lower than the rest of the monsters. This seems to be true at a small gap than anticipated. So far, I think one should ignore taking into account monsters who CRs are three steps below the parties current level (ie 1st level would be CR 0, 2nd level would be CR 1/8). I will calculate my next few fights ignoring these lower CR monsters and observe how the fights play out. I also believe that deadly fights may be the target you want to shoot for challenging fights. Fights easier than this tend to be too easy for the party who knows how to use smart and clever tactics. There is a chance that random luck can ratchet up the lethality of a deadly fight, but I've yet to have that luck come up. Also, while I say shoot for deadly fights, don't put in monsters who CRs are too high, unless you want them to drop your players in a single hit. That's all for now. I'll make another update after I run more encounters at 2nd level, which allows for a bit more variety in the encounter building.